This is the size of the portion of the thermowell that connects with the vessel or pipe. It can be in the form of a thread size, flange size, pipe size, tri-clamp, etc. This is that portion of the shank from the process connection (underside of the threads or flanges) to the tip of the shank which is inserted into the process area. It is the portion called “U” in the schematic above. To obtain the most accurate reading with a thermowell, it is recommended that the entire sensitive portion of the bulb be immersed in the process media where temperature measurement is desired. An allowance for lagging extension is specified when the vessel or pipe into which the thermowell is inserted is insulated. This is the extra length between the process connection and the instrument connection of a thermowell, which is determined by the insulation thickness. This is the portion referred to as “T” in our schematic above and could also be used on engineering drawings where applicable. The standard lagging extension allowance is 3 inches. Non standard extension allowance can be supplied by manufacturers if requested. This is the shape of that portion of a thermowell that is inserted into the process. A thermowell shank can be straight, stepped or tapered. The tapered shank is recommended as opposed to a stepped or straight shank due to the superior strength and vibration resistance. Stepped shank thermowells have a significantly reduced tip diameter improving heat transfer to the sensing element.It makes the sensor more responsive to the changes in the process temperature. a protection tube or thermowell. This style would be the considered in a low pressure,low velocity application. This is the portion of the thermowell which provides the connection with the vessel or pipe. These connections can be integral male threads, prepared surfaces for welding or brazing, flanges for mechanical pressure seals, etc. Flanged thermowells can be in three distinct configurations namely flat face flanges, raised face flanges and ring joint flanges. Flat face flanges are typically used when the mating flange is made from a casting. Flat face flanges should never be mated with a raised face flange. Raised face flanges are most commonly found in process plant applications. The raised face has a texture to grip the gasket that is placed between the two flanges. This is the material with which the thermowell is constructed. Material selection is commonly based on corrosion resistance and strength. Selection should be compatible with process media, temperature and velocity as well as the material of the vessel or pipe to which it will be installed. Common materials include 316 stainless steel, 304 stainless steel, Monel 400, Hastelloy B, Tantalum and Aluminium 316 SS. Is thermowell With or Without lagging extension? 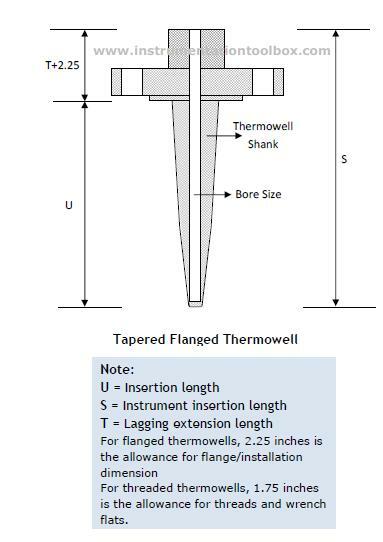 Is thermowell shank to be tapered, straight, stepped ? Is it NPT thread, Weld in, Flanged, Van stone, Socket-weld, limited space threaded, Ground joint or Sanitary? Is thermowell bore diameter 0.260’’ or 0.385’’? The list above is by no means exhaustive but is comprehensive enough to enable a thermowell to be selected and ordered accurately.